Parents who lost a teenager to meningitis are warning other parents to ensure their children are vaccinated against the disease. The Men ACWY vaccine is offered free to all 17- and 18-year-olds and first-time university entrants under 25 because students are particularly at risk. But only a third of young people get the life-saving vaccine, and cases of Men W are on the rise. Meningitis Now said it was "deeply concerned" about low vaccine uptake. 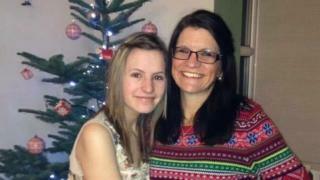 Julia Styles lost her daughter Emily at 19 as she was preparing to go to Winchester University. She had been working as a teaching assistant and had plans to become a special needs teacher. When she started feeling unwell, a few days after Christmas 2013, she was at her boyfriend's house. The following day when she tried to get up, she collapsed. "There was no rash at any point. Even when Emily was unconscious, I still didn't think it was meningitis," Julia says. Julia has decided to talk about the pain of her daughter's death, on New Year's Day 2014, to prevent similar tragedies happening to other families. Emily died before the Men ACWY vaccine was introduced in the UK, in August 2015, which protects against the four groups of meningococcal bacteria: A, C, W and Y. She wants parents to imagine exactly what she has gone through. "There wasn't a vaccine then. I didn't have choice. "I would say to parents now, 'Just imagine for a moment if your child walked out the door and the next time you saw then they were unconscious and then you were burying them,'" Julia says. She says the single most important thing parents can do is to make sure they get their children vaccinated. "Do it while you're buying them the pots and pans and things they need for university." Meningitis can be difficult to spot because the symptoms are similar to common illnesses such as the flu or a hangover - but it can kill within hours and requires urgent medical treatment. Teenagers are the second most at-risk group for contracting meningitis, after babies and toddlers. Up to a quarter of students carry the bacteria, and they tend to pass it on easily. Living in close contact with other young people in university halls means students are far more likely to be infected if not protected by the vaccine. Meningococcal bacteria are passed from person to person by coughing, sneezing and intimate kissing. Dr Tom Nutt, chief executive at Meningitis Now, said: "We remain deeply concerned about the low level of vaccine uptake - just 33% last year, which remains disappointingly below the 2015 uptake rate of 38%. "It's vital that young people and their parents are not complacent about the threat of meningitis - we urge them to take up this lifesaving vaccine." Cases of meningococcal group W have been rising every year in the UK since 2009, with 210 in 2015-16 compared with 30 in 2011-12. Dr Mary Ramsay, head of immunisation at Public Health England, said the Men ACWY vaccination programme would "save lives and prevent lifelong and devastating disability". "We have seen a rapid increase in Men W cases across England in recent years, and vaccination is the most effective way of protecting against infection." She urged teenagers and young people to get vaccinated as soon as possible and seek urgent medical help if they were concerned about their friends' health or their own. Those who are due to leave school this summer, or who are aged 17 to 18 and not in school, are now eligible for the Men ACWY vaccine and should contact their GP practice.